Tomatoes grow fast and often develop no insect or disease problems for their entire growing season. Unfortunately, insects, including the destructive tomato hornworm, sometimes invade the tomato patch. 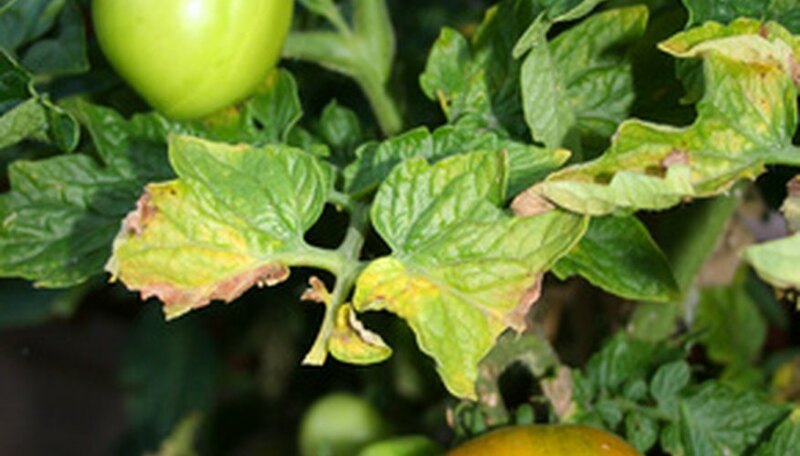 The fungal disease called tomato blight can also cause tomato leaves to curl, turn yellow and die. Luckily, safe and effective home remedies exist to address both insect pests and tomato diseases. You can control tomato hornworms, snails and slugs and some other insects by picking them off by hand and squashing them. Many gardeners choose to wear gloves when they undertake this venture because some of these creatures are not pleasant to touch. Hand pick hornworms during the daytime, and snails and slugs in the evening when they are active. You can make an effective home remedy for soft-bodied sucking insects such as mealybugs, scale and aphids with simple dish detergent. Mix 1 tbsp. of mild dishwashing liquid with 1 qt. of water and fill a spray bottle. Spray your tomatoes every other day after the sun has left your garden, making sure to cover the undersides of leaves as well as the tops. Keep checking for insects and continue spraying until all signs of them are gone. You might need to reapply your soap spray later in the summer if the insects return. Sticky traps are effective if your tomatoes have whiteflies or fruit flies. Yellow poster board and plastic zipper bags are the basis for a simple, homemade sticky trap, according to OnlineTips.org. Cut the heavy yellow paper to fit an 11- by 14-inch bag, insert it and seal the bag. Smear a sticky substance such as petroleum jelly over the outside of the bag to attract flying pests. The insects will get stuck and be unable to get free. When the sticky substance wears off or becomes too full of insects, discard the bag, put your yellow cardboard inside another bag and start over. It helps to hang several of these traps around your tomatoes for maximum effect. If your tomatoes have aphids, ants, scale insects, spider mites and other crawling insects, you can easily knock them off your plants with a sharp stream of water from your hose. Be sure to do this early in the morning so the plants will dry before nighttime, and avoid promoting fungal diseases that can occur when leaves remain wet during the cooler part of the day. If you notice small brown or black circular areas on your tomato plant’s lower leaves, it could be the start of a fungal disease called tomato blight. This blight causes leaves to die back and fruit can rot. The Bordeaux mixture, originally from France, has effectively treated agricultural fungal diseases for more than 100 years. If you want to make your own formula, Mississippi State University Extension advises combining four parts copper sulfate and four parts lime with 50 parts of water. Strain the mixture before you spray your tomato plants.